Simplicity of expression, methodological specificity of appearances with journalistic specifics of quality diversity and strength of objective arguments that even for one moment does not become recognizable as arguments of power but rather the opposite - the power of the arguments. Severity analysis approach towards Paraguayan economy, its past, present, with the aim of emphasizing quality preconditions for the future is what separates this book in comparison with similar essayistic-reportage-focused analytical essays. In medias res: Books of similar embodiments often have for a goal assumption of the manipulative actions, targeted desire of caterwaul tom through certain forms of economic determinations open doors of daffodils, using the phrase "the road to hell is paved with good intentions." No, this book is not only analytically precise, scientifically formulated and journalistic clarity, but may be a textbook of new generation. Journalists often tend to be a "universal ignorant" going towards the realization of "a little knowledge of everything" instead of "knowledge of specific manifestations humbly and strongly." Peter Tase belongs to the other mentioned, being the scientist who objectively, scientifically satisfactory form of answers to the essential question of HOW (? ), trying to not only ask questions, but also giving the answers on topics given to his own journalistic, analytical being. He reveals the bays of hope within the Bermuda Triangle of false assumptions, carrying himself with the thought that does not impose, but merely directs (and, is it a goal of objective journalism, scientific kind, primarily?) our considerations towards the methodology of knowledge about something, to have that "something" has become receptive to space and time on which he is focused at. And us with him; Not even for one moment the yielding to be trapped with manipulation by his own words (and thoughts ofcourse) that it might take away, carried him away in the opposite direction, he connects incompatible indeed, connecting people, cities, regions, and countries. Why? Because of the basic, human, civilization wish to show that on the area of the world does not walk figures deluded with conspiracy theories, but the people who make civilization of the moment and who wants to live a decent life no matter where, when, how much and how they live. Of course, the question "HOW" is essential if we focus on all of the above. Answers are found in the book by Peter Tase, of course, if we know how to read it. Not between the lines, because he was not of that kind of authors who gives troubles urbi et orbi to the people when readers’ head smashes with the question "what the writer wanted to say", but directly by decomposing the manifested and, folding it back into analytical forms of possible visions. Of the cooperation, upgrading and implementations. Of the economy, in all its forms. Of the appearances. We live in an imperfect world. A world where the rich have more and more and the poor less and less. In the world of capitalism that has overcome the possible alternatives shaped and structured within socialism in the century behind us. But whether is the capitalism that we know today lobby of the "end of history", as Fukuyama announced? Maybe we need to experience a some kind of end, catharsis in front of which is just South American area of economic potential and economic prosperity, to be able see that the answer is right in the modalities of the possible alternatives offered by this book. How? That persisting question again opens before us. The answer is, as always, painfully simple. 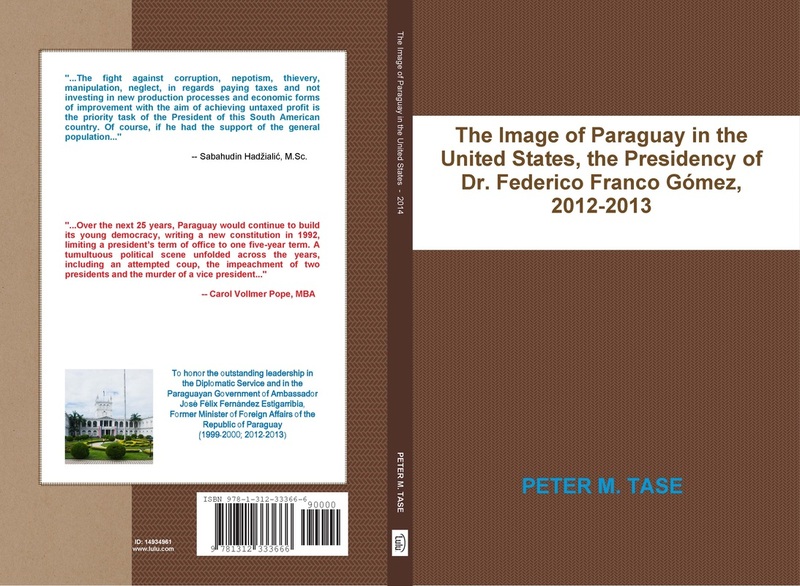 Peter Tase, when analyzing the orientation of the President’s wishes of one small (in terms of space, people, and, to some extent, limited resources), but large (at orientations, realizations, aspirations) country such as Paraguay, he uses a simple formula: The formula, which is located in a reply to challenge of the above mentioned capitalist orientations. In fact, as far as we are saying that there may be an alternative to the above, there is something in which people are forced to abuse said "put somebody on power and give him money - and you will see who really he is." In the negative sense, of course; simplicity of determination of the President of Paraguay, with his associates is proving just the opposite. That man who has the power and the money does not have just always to have negative directions. And he succeeds in doing that, bringing seemingly distant languages to other people, and vice versa. Although he explains in details the meetings of the President of this country with other officials of the neighboring countries and beyond, overseas friends, not for one moment we find no excess of condescending that owns "house" journalists but on the contrary, we have the "discoverer" of the truth in front of us. These high quality strongly substantiated truth about time and space and the impact of one man in space and time in which he lives. And works. Aspiring towards good. Writing texts of essayistic origin in EURASIA REVIEW and SPERONEWS during the period covered by this book, Peter Tase presented the consistency of his vision without departing from the basic assumptions of journalistic craft. Of what? Precisely what many journalists are missing makes this author a gifted writer.